"No man ever dared to manifest his boredom so insolently as does a Siamese tomcat when he yawns in the face of his amorously importunate wife." Writing Meezer Musings can lead to some strange coincidences. Looking for a suitable way to begin this month's newsletter, I found the quote above by Aldous Huxley. The author of Brave New World, he loved all cats and apparently even owned one or two Siamese cats himself. The coincidence in this case is that Aldous Huxley died of throat cancer, which is one of the issues we'll be talking about, in cats, this month, as we take a look at all the things that can potentially go wrong in a cat's mouth. These include common issues - tartar, gingivitis, broken teeth and tooth resorption - as well as rarer ones like Eosinophilic Granuloma Complex (EGC) and cancers of the mouth and throat. We'll start by taking a look at the structure of a cat's mouth, follow up with some tips on how to spot potential problems and what those problems might be, and finish with some tips on how to care for your cat's teeth. 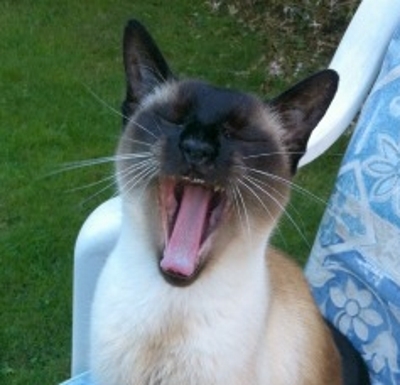 Sadly, Siamese cats appear to be more than usually prone to teeth and gum problems, so it's wise to be super-vigilant. Like humans, cats grow two sets of teeth. Kitten teeth start to appear at two weeks old and should all be through by eight weeks. These fall out when the kitten is between 4 and 6 months old and are replaced by the adult teeth. It's worth keeping an eye on this process. You won't always notice when a kitten's teeth fall out as they're often swallowed. This is quite normal and nothing to worry about, but occasionally, a baby tooth will fail to fall out, and an adult tooth will grow in beside it, resulting in two teeth in the same spot. This needs a vet visit, so that the vet can remove the baby tooth before it causes any more problems. As you can see, the top jaw has two more teeth (premolars) than the bottom jaw. Kittens don't grow molars, so they only have 26 teeth. Being carnivores, cats' teeth are designed for gripping prey and tearing meat, meaning that all their teeth, including their molars, are pointed. Cats' molars don't have the flat, grinding surfaces used for chewing plant material that we humans have. As well as looking for problems yourself, your cat's general health should be checked regularly by a vet (annually, if possible) and include dental checks on teeth and gums. If descaling is felt to be necessary this will need to be done under anesthetic, which will allow your vet to take a closer look inside the mouth. Sometimes teeth may need to be removed if they, or the surrounding gums, are found to be diseased. Domestic cats do remarkably well without teeth (even, no teeth at all) as, being fed by humans, they don't need their teeth to hunt. Cats have strong jaw bones which are able to crunch even dry food without problems and are much healthier and happier once they've had diseased teeth removed. 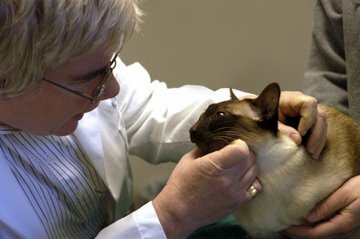 Left untreated, diseased gums and teeth can lead to heart and kidney disease (which Siamese cats tend to be prone to anyway) and even death. So what are some of the things that can go wrong? Plaque is a sticky film of food and bacteria that accumulates on the tooth surface and under the gum line. If not removed, it gradually hardens into tartar (scale), which in turn leads to gingivitis - inflammation of the gums. A vet I used to know always said that Siamese and other Orientals had longer canines than other cats (possibly because of the shape of their jaws), which was why they often broke. Cracked or broken teeth may expose the nerve which is extremely painful for the cat, as well as opening the way for infection. Resorptive lesions, also known as FORL (Feline Odontoclastic Resorptive Lesions) is an extremely painful disease - the cat equivalent of cavities, although the process is slightly different. What actually happens is that the normal way in which tooth enamel is laid down in the teeth reverses, and the enamel dissolves. What causes this isn't entirely clear, but affected teeth have to be taken out and treatment often results in the removal of all the teeth. Eosinophilic granuloma complex or EGC is an inflammatory skin condition, thought to be an allergic or auto-immune disorder which can cause problems all over the body. In the mouth area, it results in ulcers which are generally found on the top lip. It isn't common, but something to be aware of. Tumors of the mouth and throat are generally caused by a very aggressive, fast-growing type of cancer known as squamous cell carcinoma. Tumors may be found anywhere in or around the mouth, including the lips, cheeks, tongue, the upper or lower jaws, or the back of the mouth and throat, and may spread further on down into the throat and lungs. It really pays to know what's going on in your cat's mouth and look after their teeth and gums. Regular cleaning, either by you or by a vet or pet dentist will help to keep problems under control and probably prolong your cat's life. If your cat allows it, daily tooth brushing is helpful and you can get kittens used to having their teeth brushed while still small. Whether cat or kitten, start slowly and build sessions gradually, allowing the cat or kitten to chew the brush before attempting to do any actual brushing. Virbac is a company that produces a range of dental products for cats and dogs - check out the Virbac C.E.T. Oral Hygiene Kit for Cats on Amazon for an example of one brush and paste kit, recommended to me by my own vet. Unfortunately, many cats just don't like having their teeth brushed! If this is the case with yours, there are dental chews or special solutions that, added to food or water, help to dissolve and remove plaque - ask your vet for recommendations or try PlaqueOff for Cats. You can also try offering raw chicken wing tips to your cat to chew on, as the chewing action will help keep teeth and gums clean and healthy - but always remember that bones must be raw. Cooked bones should never be given to a cat as they can splinter and cause harm. Not long ago in one of the Siamese groups I belong to on Facebook I came across a lady who crochets hats for cats. As she's a Meezer mom herself (you can see one of her cats in one of the hats, below), I felt it would be nice to give her business a little boost! 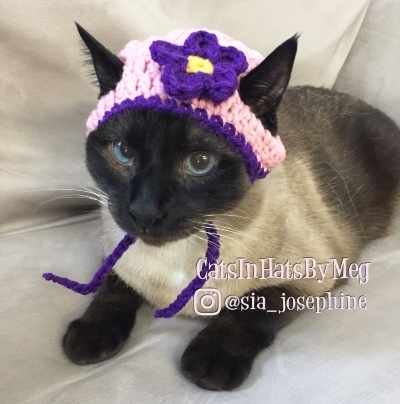 So here's to Megan from Cats in Hats by Meg which can be found here on Etsy. Loads of different styles - leprechaun hats, Christmas hats, witches' hats, unicorn hats and even bunny ears - but I thought this lovely little beret in Spring colors was very appropriate for the season and would make a wonderful Easter bonnet! April 6th is National Siamese Cat Day in the USA. The day was created by journalist Jace Shoemaker-Galloway, who invented the day to help raise awareness about the number of Siamese cats who end up in animal shelters, and to promote rescue and adoption. So April 6th is a day for celebration, cuddles and treats and I don't see why we shouldn't make it an international celebration for Meezer-lovers everywhere! While you're celebrating please spare a thought for all the cats who, through no fault of their own, are either abandoned or end up in shelters. The lucky ones make it to specialized rescues and are eventually re-homed, but it's truly a crime that so many beautiful cats are just dumped or abandoned. I happened to notice that some enterprising person on Amazon has created a 'National Siamese Cat Day' journal - there's a link to it below in case you'd like to check it out. So, as March slips away into April, with Easter up ahead of us and National Siamese Cat Day to enjoy before that and (for most of us) warmer weather on the horizon, enjoy the Spring. I'll be back at the end of April with more Meezer Musings - till then, hug your cats tight and have a great month!